Customise your own hard case for the HTC 10. Pick a memory, choose the photo, create your personalised phone case. Keep your phone protected, stylish and unique. Design a scratch resistant personalised phone case! The HTC 10 is made of a matte aluminum material and is therefore vulnerable to unwanted and nasty scratches. These scratches will definitely ruin the beautiful exterior of the phone. 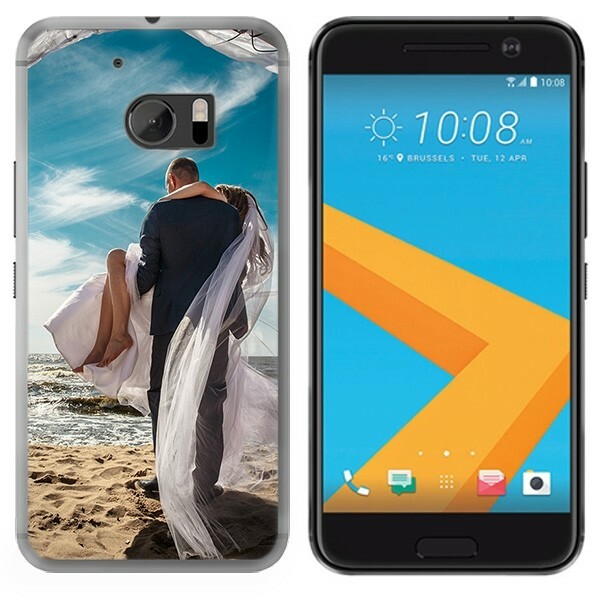 However, a personalised phone case will not only help you keep your HTC 10 brand new, but will offer unique and personal protection. Using advanced UV printing technology and high quality ink, your design on the back of the phone case will be scratch proof, meaning that you can be sure that your phone is protected in the long run. How does the rest of your personalised phone case look like? The sides of your hard case will be transparent, so your design will be solely printed on the back of the case. In addition, all personalised phone cases are made with openings where the HTC 10’s buttons should be, so your phone’s functionality should remain exactly the same! Take pictures, charge your phone and listen to music however you would like. Design your own phone case with endless possibilities! There is a lot of excitement when designing your own personalised phone case for the HTC 10. Using our user-friendly design module, you can upload all sorts of photos or designs directly from your PC, Facebook or Instagram. At GoCustomized, you are the designer, so how you want your personalised phone case to look like is entirely up to you. If you don’t have any ideas about what you image you could use, simply select from one of our popular and creative in-house pictures. It’s very easy to make your own phone case because of the vast amount of possibilities. However, when designing the case, you should always consider our 3mm margin so your print doesn’t go off the edge of the case. Do you want to gift a personalised phone case to a friend, but they have an HTC M9? You can find one here! Once you’ve designed your own personalised phone case, we will get right to work. We work carefully and professionally while trying to get you your phone case as quickly as possible. Using advanced printing technology, we can print your cover very quickly. Your image should come out sharp and just the way you designed it in our editor! 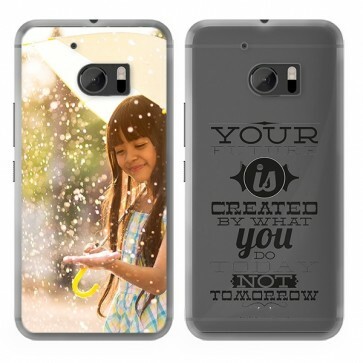 Make sure to use a high resolution photo when you make your own phone case so that the image on your phone case comes out as clear as possible! Did we mention that we do not charge for shipping to the UK? If you still have questions about your personalised phone case for the HTC 10, feel free to contact us at support@gocustomized.co.uk. Our support team is always ready to assist you!